Gold and Silver both have quite a bit of history. Gold, especially, is an important symbol of affluence and prosperity. Most of this has to do with the fact that its value is assumed to be consistent and accessibility to gold is limited to those who can afford it. Silver is not quite as large a symbol of affluence as god is, but it is very popular in metal working and is used in the process of coin production by the mint. Access to silver is also limited and the value remains intact. There are a number of pros and cons when it comes to investing in Silver and Gold. First, we’ll take a look at some of the positive points of investing in silver. One of the main one is that the value of a currency does not affect the price of silver. If a currency’s value decreases, the value of silver remains the same. Silver is also widely used by a number of different industries. Electrical components are commonly made using silver. There are also a number of medical uses for silver, including medications. Silver is also less expensive than gold but is considered to be almost on-par in terms of perceived value. Therefore, if you don’t have the available capital to invest in gold, silver is definitely a viable option. Finally, during a time of economic crisis, silver can become a viable form of currency. However, just as there are several positives, there are also some negatives to investing in silver. First, you must intend on holding onto silver for quite some time because you could end up suffering if the price corrects and you only intend on making a short-term trade. Secondly, you might not be able to profit from investing in silver as much as you would be able to with other commodities. Also, unless an economy is in collapse, silver is not a currency. In order to exchange silver for services o goods you have to convert the silver into cash which can make it difficult to deal with. You also have to be aware that if you keep a large amount of silver in your possession, it can be stolen. Gold has its own set of pros and cons. The pros are that gold is really a safe investment. Other investments have the potential to lose value and cost you money but this is not the case with gold. It also tends to hold and increase its price instead of decreasing. In the past ten years, the price has increased threefold. Also, it is easy to turn gold into cash. There are a large number of gold dealers and pawn shops where you can receive cash for gold. There are negatives as well. For example, the high price of gold means that many traders will not be able to invest in enough gold to make their trade worth the effort. And, just like silver, gold can be stolen which will result in a loss of capital. Investing in gold or silver might seem like a good idea, but even with the many pros, all the cons must be taken into consideration. With this list, you should be better able to make informative decisions about your investments. Should gold values be higher? Gold price today…American government’s declaration Monday, which it’s bi-follower, discrepancy decrease “Super” team, had unsuccessful to organize its goal of 1.2 trillion dollars in shortfall cuts assist push assurance in Washington & reserves in US lesser. This progress is clearly specified the pre-available regarding the country’s capability to pay back its arrears in addition to the poor condition of the arrears state in Europe. However, simultaneously, the dollar reinforced and gold gets down. The analyst ascribed the dollar meeting to money flowing from the risk-averse sponsors into the apparent protection of the money – a flow which several gold observers analysis as bizarre, agreed the strength of an American economy. Even though, the bank accepts that private and public sector require for the expensive metal is probable to continue high on condition that actual interest charges stay negative and risk quality on American equities stays high. Do not say that, while, that the probability of more price increases globally is no extensive high. Since Turner indicates, “These matters are not the big matters, they’re chronological international matters, and therefore they can approximately marsh the gold bazaar. The gold cost is already lofty – 24 percent higher in the dollars annual, Turner says that, “Only oil, approximately any property and I am discussing not just only commodities but also share prices etc, is anyplace near that”. When to buy gold ? Will gold price go high ? What will be gold value ? Should I buy gold ? Gold rate go down ? Throughout the year, gold prices have been steadily increasing. Gold was selling for $1410 p/oz in 2010 and has increased to $1650 p/oz in August 2011. The price of gold has increased fourfold in the past ten years and has continued to rise every month since 2008. The US Fed has been saturating the market with dollars, which is the main contributing factor in the increasing gold prices. The price of gold is measured in dollars so an increase in available dollars results in an increase in gold prices. The recent increase in gold prices does not reflect a consistent trend. The price of gold decreased from $590 to $327 in 1985 and then dropped again fifteen years later to $273. In 2005, however, the price increased to $513 and then went on to double by 2010. The main indication of the market value of gold is the supply of dollars but these fluctuations in price indicate that there are a number of factors that can have a significant impact on increasing or decreasing the price of gold. The London market determines the selling price of gold daily. However, the price is strongly influenced by supply and demand. When there are more buyers in the market, the price of gold increases. Only one quarter of gold is actually purchased by banks, investors and traders. The rest is sold to dentists and to be used in the production of jewelry. Gold mined and sold in recent years can be adjusted for commercial purposes if necessary because it is very liquid. Because of that, the price of gold is not affected as much by the rate at which it is mined. The price of gold is also impacted by the trade agreements between countries. No more than four hundred tons of gold can be purchased by the United States and other member countries that belong to the Central Banks of Nations in a single year. This agreement is due to the Washington Agreement on Gold. This shows how the price of gold can fluctuate due to trade agreements. The price of gold can also be influenced indirectly by interest rates. If interest rates are increased by the banks then the price of gold will decrease. If interest rates are decreased, then the price of gold will increase. The demand for gold increases drastically when inflation increases and social conflicts are feared by the population. People tend to increase their supply of gold to be used in a situation where paper and coin money might not be viable currency. When this happens, and the demand for gold increases, the price of gold increases as well. Gold prices can also be influenced in the stock market as attempts to make a profit by short selling gold are used. This is basic rules about gold price. Now see gold analysis and gold price today. There are a variety of ways to play the gold markets depending on how much you wish to invest and what your goals are. The more gold you’re investing, the more resources you’ll have to help you, including professional help and analysis, specialists to track marketing trends and to follow the news flow and more. For those who are not investing as much may not have these resources available to them, so their investment decisions are the result of impulse instead of informed strategy. Many first time gold investors are attracted to the many appealing offers used by scam artists. Because of that, when you make the decision to invest in gold, it is important to remember that you should be very cautious of bargains that sound too good to be true. If anyone is offering you a price that is lower than the market price for the day then you should seek out a more reputable vendor. Normally, you will have to pay an added premium to the prices for the day to cover taxes, overheads, and profits for the vendor. Also, there will never be a discount on gold if you are buying in grams. When you are buying gold, you should always receive a certificate that documents the purity of the gold as well as the exact weight, down to the last milligram, of the gold that you are buying. However, there might be an exception made when you are buying gold biscuits or coins in international standard packets. You can look for different quality markings when you’re buying gold jewelry. You should look for a “hallmark” which is one of the most common quality markings, though the markings can be different, varying from one region/nation to another. You should also be certain to hold on to your documentation if you ever choose to convert your gold into cash or another asset. It is not difficult to obtain the most up-to-date information on gold. Use the internet to make sure that a deal you’re thinking about making is genuine or not. Make sure you do your research before you spend your money because you’re assuming that the gold you are purchasing is the quantity and quality that is stated by the vendor. You should also make sure to locate a vendor who will purchase back the gold at rates that were current on the date of sale. Keep in mind, though, that they will deduct a small amount for incidentals and other expenses. Also, gold jewelry could use a few milligrams of weight over a period of time if it is being used on a regular basis. If you are going to invest in gold, make sure you are buying from a reputable vendor. Offers that are too good to be true, or cheap offers from a family or friend could be a trap. You should also make sure to avoid online auction sites because gold always has buyers at ruling prices. How to use Current Gold Triangle Pattern and trade ? Essentially, gold proceeds to be discovered as a wealth store during the economic turmoil. As numerous investors lose their faith in the paper assets, gold usually will surge in cost as people seem to hold real assets. Presently, we are viewing mixed signals about whether the debt crisis in Europe is getting worse, or it is improving. Based on this information, we will take care or watch carefully on the economic calendar for more details on our basic outlook. 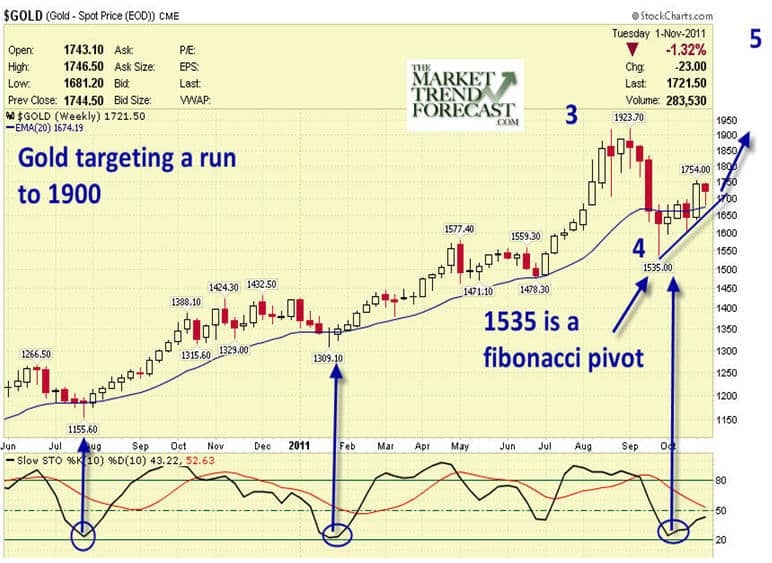 As you see we made our Gold Forecast 2012 and we see bullish trend in next year. But what trade now ? 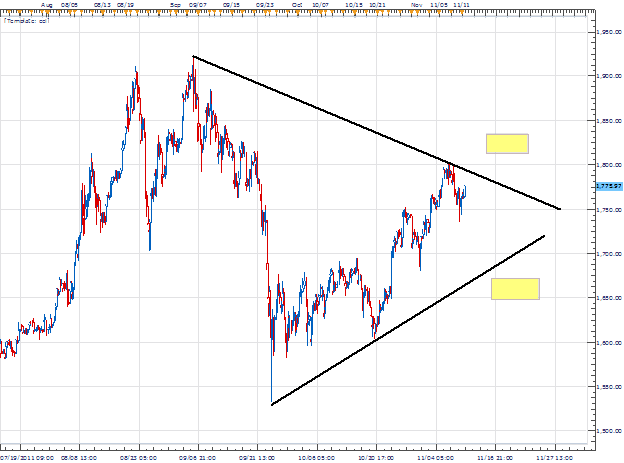 My first choice is to place the entry orders in expectation of a breakout usually on gold. The entry orders must be placed close to $1830 to buy as well as $1640 to sell. Alternate scenarios let in price trading inside the triangle pattern before a break. What will you trade ? If someone has ever traded the Silver or Gold market, in that situation, you recognize that this is not particularly for faint of heart. Everybody has seen some commercials on television concerning buying gold as well as how one can add this into their portfolio. This is a very good idea, isn’t it? I will let you to decide on that. Though, I am giving you some information, which may assist you in making your decision. Firstly, gold has now moved from $260 per oz. to $1730 per ounce in 7-8 years. Suppose, if you had 1.5 ounce of gold, so you have surely made $1,450 about 520%. Now, this is a very good return. However, when it has risen to about 500%, you should buy it or not? Yes, you should definitely buy it, particularly when it is about the gold. Though, risk has now increased as well as this is good to buy gold on dips rather than only buying it plus hoping the best for you. Thus, there are essentially four methods of buying the gold. The method of buying gold coins is harder as formerly you buy gold coins then you need to sell these gold coins. You cannot utilize them at the Wal-Mart. Instead, you can take gold coins within your pocket, although you will need to find out any special venue so that you can chuck out of them. Hence, last three methods are the easiest one for controlling gold and also take benefit of the move and also not concern regarding its sell. Yet again, I will let you decide so you can decide which one is perfect for you. Based on Fibonacci levels Gold will reach 2000 in the end of 2011 and in beging of 2012 we can see more gains.For now main pivot point and strong support is 1500. Based on gold and silver correlation we predict : Silver forecast to exceed $45/oz by end-2012. Global silver (silver market) mine supply is expected to maintain (very strong) its upward trend in 2012, rising to an eighth consecutive all-time high. In latest weeks and months, we have observed that gold amend its band. Not so longer does gold seem like the final secure haven trade. Actually, it has approximately become the entire conflicting, following the lows and highs of anti-hazard trade, equities. Conventionally the gold has now been observed as the final safe haven; and it is moderately liquid (the defining feature of a secure haven trade), this is a corporeal asset (for example, it’ll be just about even if economy goes down), it is stored by the central banks. However, the golden metals have been vended off in current months on apprehension that the Banking sector in Europe was going fail because of the independent debt crisis. Gold has pursued the Dow (a substitute for risk) while the summer that deteriorates its case designate a secure haven. Nevertheless, if you truly examine the performance in the current years its doubtful if the gold has still been a secure haven. How can we condition that the gold is secure haven procure if it purchased during the times of certainly and uncertainly whereas the gold erstwhile in the bull market for about eleven years. Although, in the early period, the gold had historical pessimistic connection with hazardous possessions like stocks, and its tendency to move advanced over the previous decade might have been flawed as an attribute of a secure haven. Therefore, it should not be surprise that the gold now has been a prey of the EDC European Debt Crisis. However, there is one more part of this argument. The current vend off in gold begun when it hits the record lofty of nearly 1,900 dollars per ounce reverse in September. During the month of July and August, the 400 dollars increase in cost of gold that was the biggest price increase in the record of the gold metal over couple of months. In 2007 & 2008, we observed alike gathering in the cost of gold, then a cutback of approximately 150 percent following the initiate of the monetary crisis in year 2008. Therefore, gold might be a prey of its personal achievement and the hazards being paid dole off throughout periods of financial disorder because the investors need money and consequently have to vend their most beneficial assets. Another part we have to look is the variation between global uncertainty and times of local uncertainty, and their upshot on gold. Although it was a possible default and it was always more probable that United State politicians will make an eleven hours accord to avert adversity, and certainly they did. Therefore, it would emerge immediately that gold could only gathering if a universal problem looks solvable. The European debt disaster has been powerful for almost two years, and by no end, in view the investors are now getting anxious and even trenching safe havens as gold in support of additional liquid assets like US Treasuries and the dollar. Looking ahead, what can be expecting from gold? Now the short-range future will probably depend upon the ability of the European authorities to grow a practical way out to their debt predicament. From the start of this week, gold pair is on the decrease, along with that spot prices are also moving to a low point $1,604/oz. sharp decline of billion may continue to retrace from a high point $1,921/oz, because the players are looking ahead of U.S dollar. Since the Federal Reserves are on the float, so the idea is to expand the balance sheet further. Let the speculation to be increased further, and for reserve currency, the trend should be bearish. Board member of FOMC Daniel Tarullo focused on renewing speculation for the quarter 3, and he insisted on purchasing the new assets. The federal government may look for widening the monetary policy because there is a risk factor involved due to double-recession impact. On the other hand, Fed president of St. Louis James Bullard suggested that Fed should look for quantitative easing under such intense economic conditions. As a correspondence, the expectations are that Gold will be rebound for the short-lived purpose. This is needed from the central bank for the Q3 to fulfill the expectations. This could lead to the bullish trend in USD, and the rebound of bullion will go back to the previous month position. However, the current weakness of the greenback may continue its work for the coming week. This is because a cautious outlook is being maintained by the Fed of the world’s largest economy. As a result, the gold prices might go higher to above $1,700/oz. Currently gold price is 1750. Investors like to have gold as much as they can. If the deals have been done in the form of gold, then it will help in any unexpected condition. For your investment, you have to get an idea of the issues which affect the rate of gold. We can say that the deal in the form of gold is not a business but can be called as gambling. Due to gold, people can get a large amount of money without doing anything. Newsome s comers should have should have some safety measures, otherwise they can drop their currency. 1-	First of all, you have to know that purchasing gold is altogether dissimilar from making investment in gold. If you purchase gold, you are just paying for metal. You will save your metal. After some time, either the rate of gold will be increased or decreased. In such case, if you sell your metal you will either get some profit or some loss. We can say it “call” contract. On the other hand is “put” contract. In put contract, there is more profit as well as more danger of loss. Mostly, these contracts are paid or purchased with 10% increase in real price. If your gold is of 100,000$ then you will put up 10,000$. In case, the rate is increased then you will earn a lot of money. On the other hand, if the rate is low, you will lose all your money. 2- It is good for you to know about the issues which cause increase or decrease in the rate. There are 3 main factors, which affect the most. Due to new comers, the demand of gold will get increased. China is buying gold intensively. It has increased the rate of gold. The second issue is the rate of dollar. People start buying a lot of gold, when the rate of dollar is decreased. It effects on the value of gold. The third important factor is indecisive economic condition. If the economic condition is not good, people start buying gold. In this way the rate of gold amplified. 3- You should have an account for the purchase and advertise of gold. Mostly, people bring into play discount brokerage. Purchase and selling of gold is directly related to the cost of gold, that’s why traders increase a little with firms of discount brokerage. 4- Always know the rate and futures of gold. You should know latest information about the cost of gold. There are many online sites which can tell you about present rate. You have to know the price related to futures contracts, as it is a bit dissimilar to others. You can see all this from online sites. If you want to see some instances related to gold futures then you can verify website “Chicago Board of Trade”. 5- You can get an idea by checking in detail the trading samples. If you feel that you have got enough knowledge, and then check your luck in gold futures. If you are afraid of loss then do not make order for selling with all trades. In this way, you r gold will be sold if the rate of gold decreases to a certain amount. So, your loss will be as less as it can be. The traders who makes perimeter for their loss and always ready to get advantage are the victorious traders. How to trade gold using forex trading account ? In Forex Market, prices are lists in pairs. A trader is allowed to sell or buy a currency by checking rates of Forex. If one has to deal in gold, then selling and buying should be at one time. Another gold quote is “Spot Gold Rate” (USD /XAU), just like Forex quote. Here, the initial symbol is for 1 troy, ounce. So, US$1,000 XAU/USD shows that 1 ounce gold is equivalent to US$1,000 having change in the cost of dollar. Moreover, the rate of spot gold is called “the ask rate” and the rate for purchasers is called “the bid rate”. The dissimilarity is called “the spread” which is same in Forex market also. But in spot gold, the rates vary rapidly. A trader of spot gold gets a quote which shows spot gold can be put up for sale at the rate US$1,000 and can be purchased at the rate US$1,001. So, 10 ounce of gold having cost of US$1,000 can be purchased at US$10,000. If the rate gets high US$1,000 for one ounce or for US$10,050 for 10 ounce, the dealer can earn US$50. On the same way, if the rate will get decreased, the dealer will have loss of US$50. It is very easy to know online gold trading. Always keep in mind that this trading has benefits as well as losses. So, the beginners must know all the factors.